For those who know how my inanimate furball Garfield is constructed as a soft toy, they will know that Garfield has a super big head in proportion to his torso, long lanky legs, a tail and a big tummy. Given his construct, Garfield cannot stand on his feet. He will collapse into a sitting position but topple over as the tail is in the way. To balance Garfield to sit properly the tail must be moved out of the way so that his bottom can sit on the surface. Lately, I noticed that when I wake up and put him against the wall where my bed is aligned to, Garfield is actually left standing. I guess it is the way I prop him up on a pillow (his own Garfield pillow) and rested against the wall, he is actually standing on tippy toes. Yes, I am a loon for even posting it – it is as if my Garfield kid is able to stand, just like the same euphoria that parents get when their babies start to crawl or takes that first step! An artistic rendition of my inanimate furball Garfield I have never seen before. As if 2 personas in 1, or “schizoprenic” I quipped to Bird who sent this. A dark side of Garfield if you will…trapped within a confident and towering Garfield, squealing to get out! Oodles Of Garfields – All Mine! Nothing makes me happiest than seeing oodles of Garfields…or mountains of these inanimate furballs! What’s Up With My Inanimate Furball Garfield? Garfield is the king of this miss! Even when I sat on tail of his. Too precious to be missed! As I sit and ponder on life’s imponderables, I added another to my list. What will become of my inanimate furballs – all my Garfields when I report to the heavenly realm? Will the people who receive them find them “useless” as these days, drones, gaming consoles or computer games are the rage. Will my inanimate furballs be treated as a waste of space and thrown out, to be incinerated? Garfield, like any soft toy or cottony stuffed toy is only meant for cuddles and hugging. It does not talk back not does it give you a score should you use it to thwack anyone with it. As the world spins and changes in tandem to the tune of being a smart nation status, we hear of block chain technology. Jobs change – these days we have drone operators. Literally flying a drone as a vocation! A job come true for those who love piloting without need to climb into the cockpit. We also have platform developers and we do not mean platform shoes..oh no no! These are platforms for online stores, shopping for ordering eats. For food delivery, we have Deliveroo, Food Panda, Honest Bee and a whole host of other delivery food companies. One need not walk out of the home spend money and have goods delivered to your doorstep. Garfield cannot do any of these. He just sits and stares back me. He stays where I leave him. Immortalized in pose as I leave him for work and on my return, I will regret leaving him on his head! Yes, Garfield may soon become an obsolete, alongside the Teddy Bears, Disney characters and other plushies. 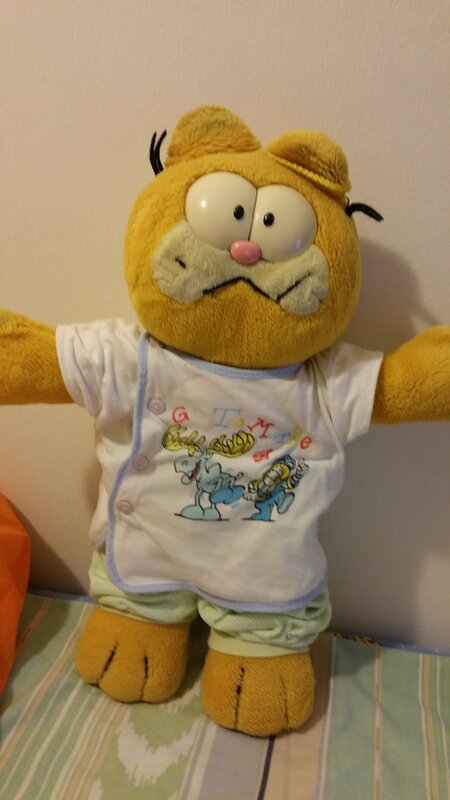 I am from another planet – old school…..I will join many others who are soppies for a Garfield hug! Black irises faded till white of eyes. How aged and faded are his plastic “cataract” eyes. Soon Garfield has sparkly black eyes! Nightly, I re-color Garfield eyes. But alas, not so deft hands causes black ink onto whites of eyes. Forever the love in my eyes. I shrieked when my brother who lives in Hong Kong sent me Garfields on display at Tsing Yi mall. These Garfield characters are taller than human height…about 8 feet high. 2. Garfield standing tall…this is always my favorite Garfield pose. 3. Odie in a crate, being uncrated and covered in styrofoam. Don’t you just love my inanimate furball?!!! I have a procilivity to hug my inanimate furball Garfield whenever I am down or just in need of a hug. Garfield does not lie nor cheat. Garfield just sits quietly letting me whine or moan about a bad day. A purrfect pet of sorts! I wonder if Garfield could talk back…what would he say? Garfield and Garfield products are a trademark belonging to Jim Davis and his company Paws Inc. 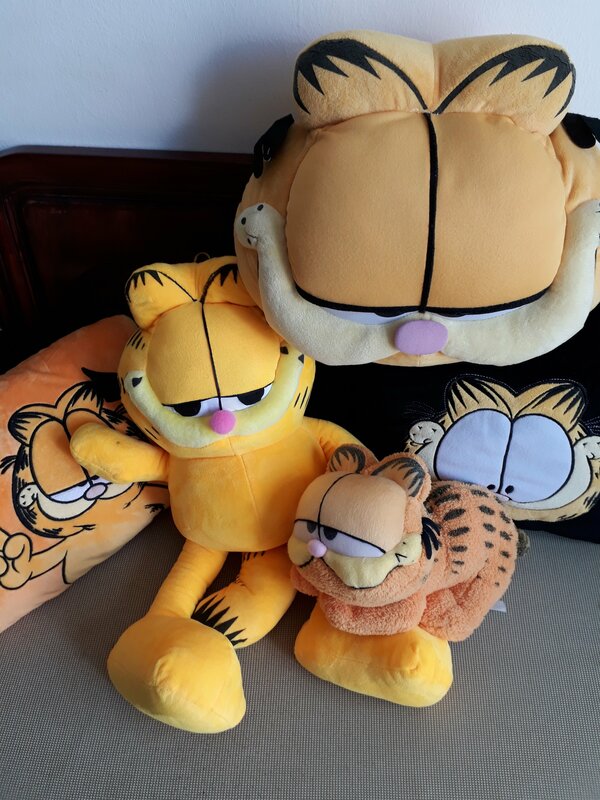 There are counterfeit Garfields out there from China and I will not buy those as it affects Garfield’s existence. “Please release me….let me go….for I don’t love you anymore…..” are lyrics from a song that remains in my head. I am unsure who the crooner is…maybe Andy Williams 🤔…? Anyway….Mr EX and I have been “battling” over Whats App messaging the last 2 days. More like bantering to the point of my frustration. I keep telling him release me from this horrid unending “ship” of sorts. In fact no “ship” as he is neither a friend nor a person of relations. 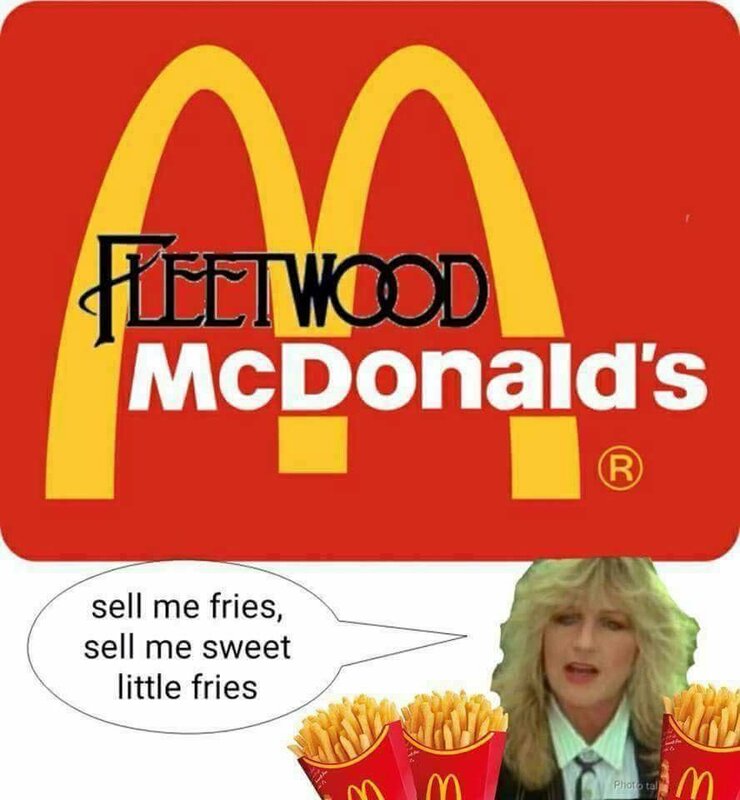 Maybe Fleetwood Mac’s ” Tell me lies, tell me sweet little lies… ” describes us better….or….